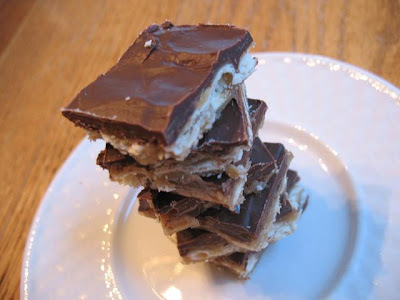 I thought about giving favorite dessert recipes (Friday's Favorites or something) and thought the chocolate title seemed to fit me. I'm known for my desserts, but I always have to explain that my skill is not in cooking (just follow the recipe), but rather in spotting and collecting yummy recipes! Have you made these before? If not, give them a try and let me know what you think. Preheat oven to 350 degrees F. Cover a rimmed cookie sheet with foil and oil foil. Line evenly with saltine crackers (roughly 45?). In a large saucepan, melt 1 cup butter and 1 cup brown sugar and bring to a boil. Boil for 3 minutes, (my gas stove only takes about 2 minutes - mixture will almost start to pull away from sides of pan) stirring constantly. Immediately pour mixture evenly over crackers. Put in oven for 5 minutes. Remove, tap down floating crackers and immediately sprinkle a bag (or 2 cups) of chocolate chips over top, let melt and then spread across top. You can also sprinkle chopped walnuts on top if you like. Chill to let it set up. Cut up however you wish, or break into pieces. I would love to hear your comments! Thank you for stopping and smelling the chocolates with me!! Currently disabled anonymous comments due to spam attempts - thanks for understanding! We all need a little break from our stressful days. Come on by and I'll try to brighten your day a bit. If that happens to involve chocolate, even better! Your version of "smelling chocolates" might be reading scripture, gazing at God's marvelous works, listening to children laugh, looking at a blog, calling a friend, sipping tea, savoring a really good chocolate or all of the above! 1 Corinthians 10:31 Therefore, whether you eat or drink, or whatever you do, do all to the glory of God.